Mountains are arguably the best place to view the gorgeous display of colors of fall foliage in Korea. Everywhere you look, leaves painted in scarlet, golden, amber hues will show off their seasonal beauty. If you are looking for a colorful, natural landscape to feast your eyes on, then look no further than mountains during fall. 1. 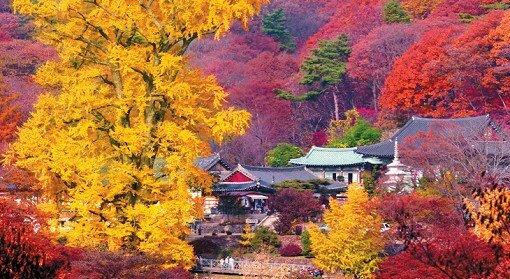 When to go for Fall Foliage in Korea? Although October and November are usually the best months, the foliage forecast differs depending on the region. Below is the tour schedule for 4 mountains. This should give you a general idea about the peak foliage period! Seoul -> Daedun, Deogyu or Naejang mountain takes 3.5-4.5 hours. *Traveling time on Saturday may take 1-2 hours more, depending on traffic conditions. Overall, the peak period for viewing perfect fall foliage is not super long. Hence, make sure to plan out your mountain tours in advance! 2. What to bring for hiking the mountain in Fall? In addition, don’t forget to bring your camera! You will absolutely want to take pictures of the breathtaking fall foliage scenery. For those of you wondering, Indiway’s one-day mountain tours include not only round-trip transportation from Seoul, but also entrance tickets, breakfast (bread), a bottle of water, and English/Chinese speaking staff. 3. Who can go for hiking mountain in Fall? Yes! 🙂 Anyone who would love to see nature’s best colorful scenery should definitely join one of these mountain tours. The mountain courses for all 6 of our tours are easy enough for even children and elderly tourists. Although certain parts of some trails (e.g. Daedunsan, Deogyusan) may be a bit more challenging, those parts are completely optional. If you would like to stay on the easy trails, ask the tour operators for guidance. Although certain parts of some trails (e.g. Daedunsan, Deogyusan) may be a bit more challenging, those parts are completely optional. If you would like to stay on the easy trails, ask the tour operators for guidance. However, if you are more adventurous, the tour operators will give you directions and/or a guide map so for more exploration on your own. In any case, you will get plenty of guidance while on the mountain! 4. What to eat near Fall foliage Mountain? You’ll get to spend a total of about 4 hours on the mountain, including lunch time. This should give you a decent amount of time to enjoy the scenery. For lunch, you will get to choose from a variety of Korean dishes at a nearby food court. There will be bibimbap, spicy pork stir fry (Jeyuk bokkeum), various stews, and more! 💡 Indiway Tip (1) At Songnisan Mountain and Daedunsan Mountain, we would recommend you to spend more time in the mountain area because there isn’t too much to see near the restaurant area. 💡 Indiway Tip (2) For Muslim visitors, the tour staff can assist a vegetarian menu because there is no Halal restaurant near those Mountain. Just remember to leave a memo during the booking process! 5. What can see in the mountain in Fall? Striking fall (autumn) foliage view from Daedunsan Mountain. A picture is worth a thousand words, and here you have 3 pictures. You’ll get to see all this atop Daedunsan Cable Car! No words can fully express the sheer beauty of Naejangsan Mountain. A healthy walk along this mesmerizing road would be very rejuvenating. Naejangsan Mountain absolutely deserves your time! These are just 2 of the mountains – so much more awaits! If you would like to stay in Seoul for autumn foliage, check out our blog post about great Autumn Foliage Tours Near Seoul. 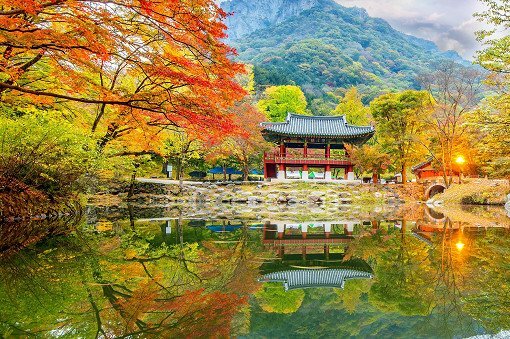 ➡ Seoul Autumn Foliage One Day Shuttle Bus Tour might be the perfect one for you.